"Although I teach middle school kids for a living, one of my passions has always been plants. 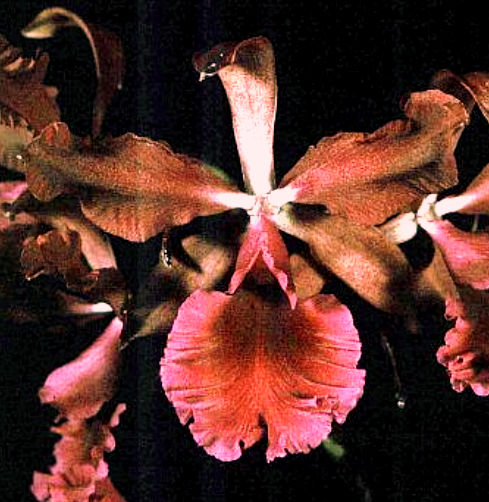 I began growing orchids as an offshoot from working at Longwood Gardens in Philadephia just after college. From the very beginning it was all about Paphs, particularly awarded and select clones of historic importance, of which my collection numbers nearly 3,000. While I love finding old, rare stepping stones in Paph breeding, I also do a little hybridizing of my own, and growing up my own babies is a blast. 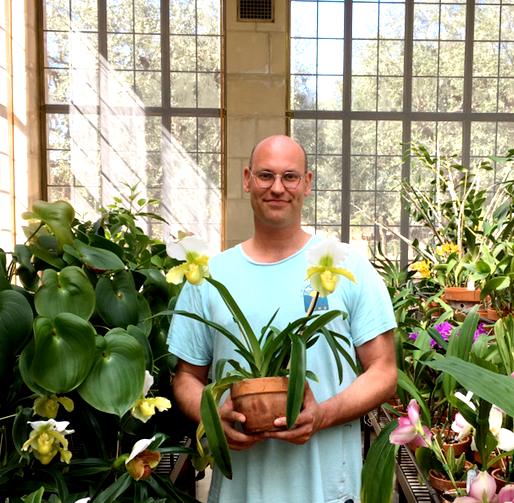 I am the youngest accredited judge with the American Orchid Society, and have served in various capacities with various orchid societies in California and on the East Coast. I love meeting other people who like orchids too, and doing so often finds me traveling to shows, vendors, and peoples’ greenhouses to see the latest and greatest in new hybrids and to get the best orchid gossip. I like to be involved in plants as much as possible: in addition to Longwood, I’ve worked at the Smithsonian Institution tending to their orchids, and for years for the United States National Arboretum, collecting rare plants and documenting cultivated species and hybrids for their herbarium. In short, I really like plants." 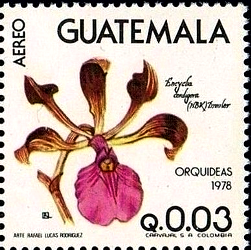 For our May, 2019 meeting, Tim will tackle the group of New World orchids known as Encyclia, from "Mexico and Beyond". These spectacular Cattleya relatives grow well outside in Southern California, and with their compact habit, great fragrance, and ease of growth, these are delightful plants for every collection. By extending the traditional definition of Encyclias to include recently-separated groups like Anacheilum, Panarica, Prosthechea, Euchile, and others that Tim says he and many others grew up calling Encyclia (maybe that's how Tim first knew them, but some of us at South Coast Orchid Society go back far enough that we still think of them as Epidendrum! — And now, a BIG THANK YOU to the taxonomists for giving us so many possible names, each more difficult to spell than the last ones they proposed, for these otherwise delightful plants), we end up with a diverse, beautiful, fragrant, exciting group of plants and flowers; if we add those to the wonderful flora of Mexico and Central America, we have a group that every collector should grow. 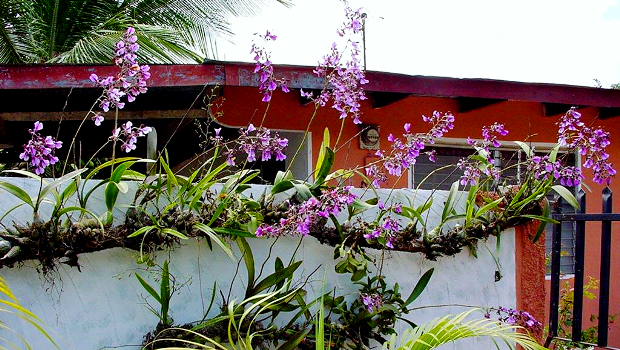 By the end of this presentation, you will have a new appreciation of the range of plant habits, floral forms, and fragrances of Encyclia broadly, as well as an appreciation of their lovely flowers and ease-of-growth. 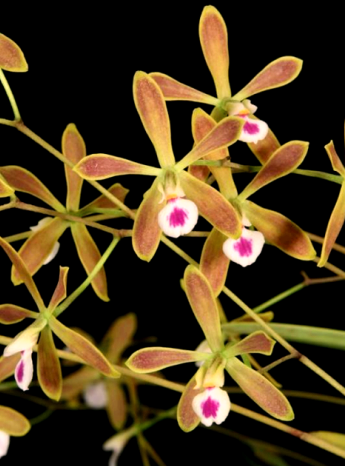 Quite a few Encyclia and related species have been used in hybridization, but it seems to us that their potential is only beginning to be appreciated. Relatively few of the registered hybrids have found a wide following in the trade or on judging tables. 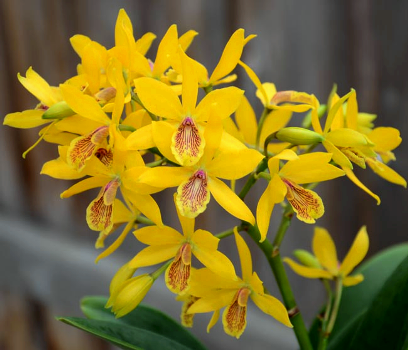 One recent exception is the interesting hybrid Guaricyclia Kyoguchi (Guarianthe [=Cattleya] aurantiaca x Encyclia incumbens [=aromatica]), which produces clouds of bright yellow flowers with a pretty lip, and a few clones with semi-alba flowers. 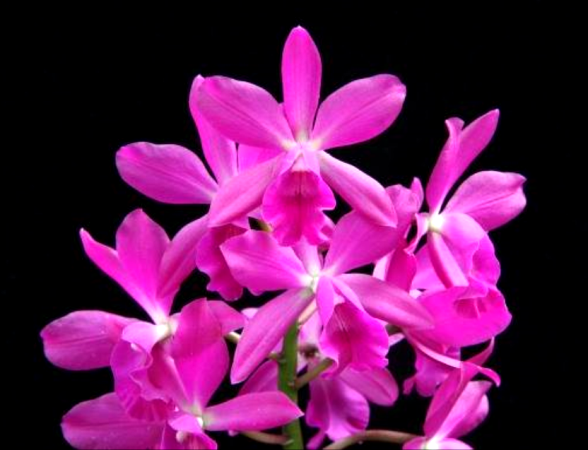 This hybrid is now turning up in new crosses at Sunset Valley Orchids. Another strategy is to cross interesting Encyclias with large or floriferous Cattleyas. 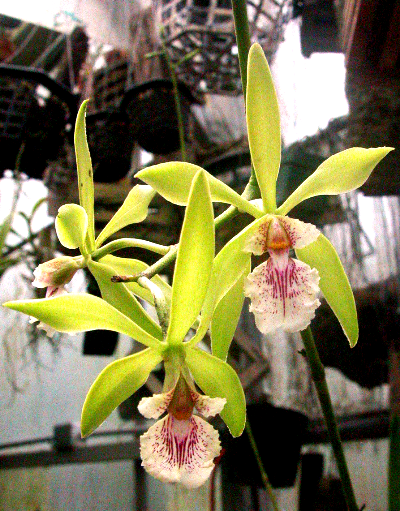 Two impressive examples are shown here, Guaricyclia Voila (Guarianthe bowringiana x Encyclia cordigera) and Catyclia Florida (Cattleya dowiana x Encyclia cordigera). 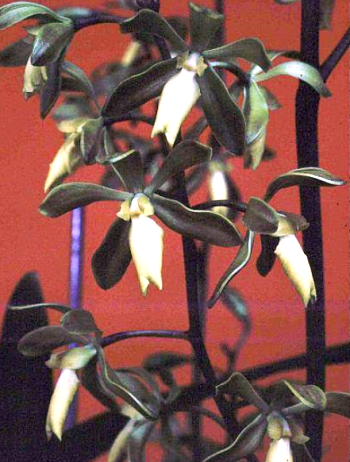 There is a lot of natural variation in many of the Encyclia species: alba varieties, variations in the size and color of the lip, varieties with much darker petals, etc. 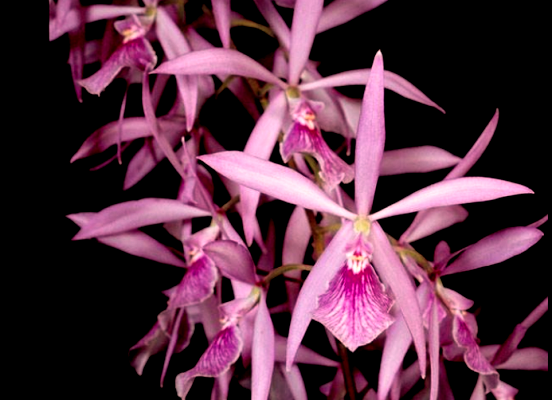 There are also Encyclias (and varieties) with many different fragrances, such as raspberry or chocolate. Watch for new hybrids! Guaricyclia Voila, one of those hybrids that just had to be tried! Tim will be a plant table of seedling Encyclia species from Central and South America, suitable for culture outdoors in Southern California — a great opportunity to expand our orchid collections! 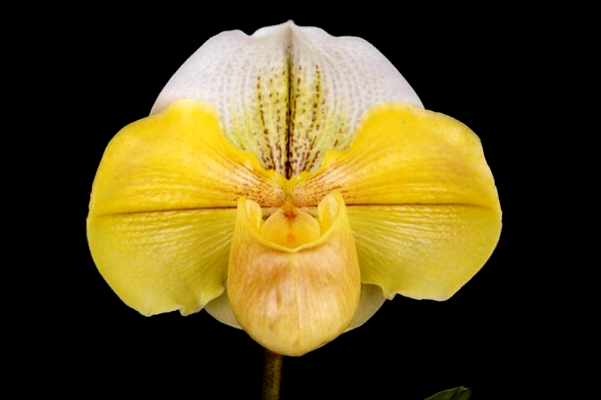 Copyright 2019 South Coast Orchid Society, Inc.